Over the past week I’ve had a lot of fun working with Malvern’s team in China to deliver a series of seminars designed to help researchers engaged in pharmaceutical product development. These meetings focused on how Malvern’s material characterization systems can help those developing and manufacturing oral solid dose formulations. During the seminar series, we had the privilege of meeting with well over 200 customers, providing us with the chance to learn about the challenges they are facing in product development, as they seek to select APIs and excipients which have the perfect particle size (as well as shape and composition!) to achieve reproducible drug delivery. 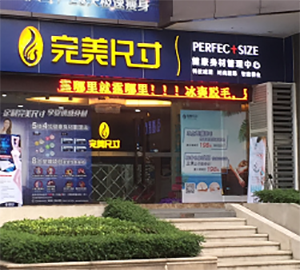 Now, the shop above is not offering particle characterization advice, but is hoping to convince the people of Guangzhou that it can help them in achieving the perfect body size. This is a goal I gave up on years ago, so it was lucky that our seminars concentrated on materials science! Defining the perfect size for pharmaceutical ingredients starts with deciding what the drug product being developed needs to achieve. In the Quality by Design (QbD) approach to product development, this definition is often referred to as the ‘Quality Target Product Profile’ – the ‘why?’ of a development program. For innovator companies, this is a definition of the requirements for the patient group being targeted by a new therapy. For companies developing generics, the definition comes from the properties of the Reference Listed Drug (RLD) product they are trying to reverse engineer. Why consider particle properties for Oral Solid Dose? How can laser diffraction, image analysis and Raman spectroscopy support oral solid dose deformulation? How can realistic methods be developed in support of ANDAs? What can be done to maintain methods during a product’s lifecycle? Here we considered how particle size and shape analysis systems, such as the Malvern Mastersizer and Morphologi systems, are validated and maintained, and how system upgrades may be carried out. Judging from the questions we received (which lasted for well over an hour within each seminar! ), these topics were extremely relevant to the attendees. Laser diffraction systems, such as the Mastersizer 3000, are widely applied in China for routine pharmaceutical sample analysis, so many of our discussions were related to method and specification selection using the technique. However, the star of the seminar was the Morphologi G3-ID and its application of Morphologically-Directed Raman Spectroscopy to measure component-specific particle size and shape distributions. This is perhaps not surprising, given the FDA’s recent announcement confirming the important role this technology can play in bioequivalence studies. The Chinese pharmaceutical industry is growing rapidly in response to the demand from the country’s growing middle class for new and improved medicines. The subjects discussed at this seminar series represent only a small part of the challenge the industry is facing as it seeks to increase the speed and quality of product development in response to patient demand. It was good to have the opportunity to spend some time with the attendees, helping them understand how Malvern can provide support to their development programs. Access all our upcoming live events by visiting this page and register for free.